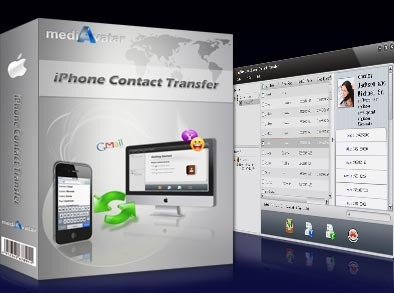 Preventing your iPhone contacts from any loss, mediAvatar iPhone Contact Transfer for Mac provides the best solution to export/backup and restore your iPhone contacts. It helps you backup iPhone contacts to Mac as .csv and .vCard files that are commonly used by other address book like Google Contacts, Yahoo address book, and add/export contacts from .csv and .vCard files created by mediAvatar iPhone Contact Transfer for Mac or exported from other address book. All of these makes you export, backup, merge, and sync the contacts info among most of your address book freely and effortlessly. 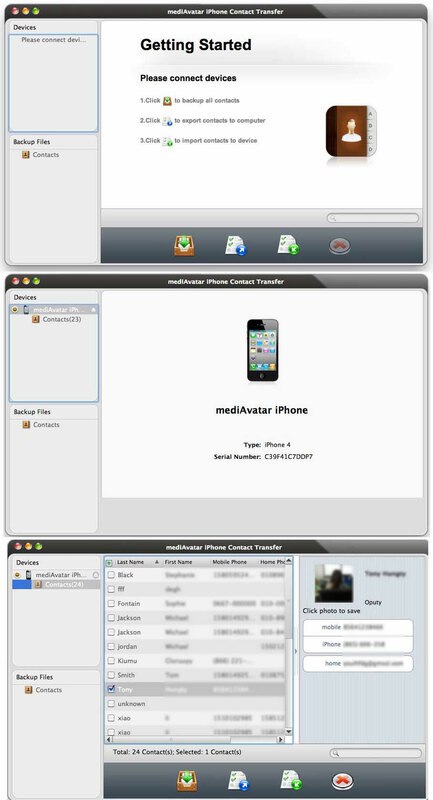 mediAvatar iPhone Contact Transfer for Mac also offers another way to backup your iPhone contacts on Mac: you can backup the contacts as mediAvatar backup file which can be directly opened in this tool even without iPhone connecting and you can just one click to restore to iPhone in future. Now simply manage, view, check, sort, search, and delete your iPhone contacts with this iPhone Contact Transferring software for Mac. Irreplaceable Mac iPhone contacts backup software, preventing you from contacts loss, download to have a try. Export and backup all or checked contacts info on your iPhone to Mac computer as CSV or vCard backup file for future use. This iPhone backup tool for Mac enables you to import and add iPhone contacts from CSV or vCard backup files created by mediAvatar iPhone Contact Transfer for Mac or exported from other address book without overwriting existing contacts. Besides CSV and vCard files, you can also backup the contacts as mediAvatar Backup file which can be opened by mediAvatar iPhone Contact Transfer directly and can be restored to iPhone in one click. Provides concise interface and makes it easy to sort the contacts, view the contact info in list and iPhone-contact mode, search and delete the contact(s). You can transfer and backup contacts to CSV or vCard files which are common-used; or backup the contacts to mediAvatar backup which is easy to handle via mediAvatar iPhone Contact Transfer for Mac. Share iPhone contacts info with Google contacts, Yahoo address book, and other mobile phones address book by importing iPhone CSV or vCard files to them; import contacts in CSV or vCard files exported from Google contacts, yahoo address book, and other mobile phones address book. Check the expired or unwanted contact info and delete it (them) using mediAvatar iPhone Contact Transfer for Mac. Display contacts in list and iPhone contact mode, sort contacts by specified item, quick search to ease your contact query. mediAvatar iPhone Contact Transfer for Mac is available in English, German, Spanish, French, Italian, Japanese and Traditional Chinese interface languages. mediAvatar iPhone Transfer for Mac can backup your iPhone videos and music to Mac or iTunes. Transfer online/local videos, audios, PDF to iPhone; backup iPhone to Mac or iTunes; Create iPhone ringtones on Mac.